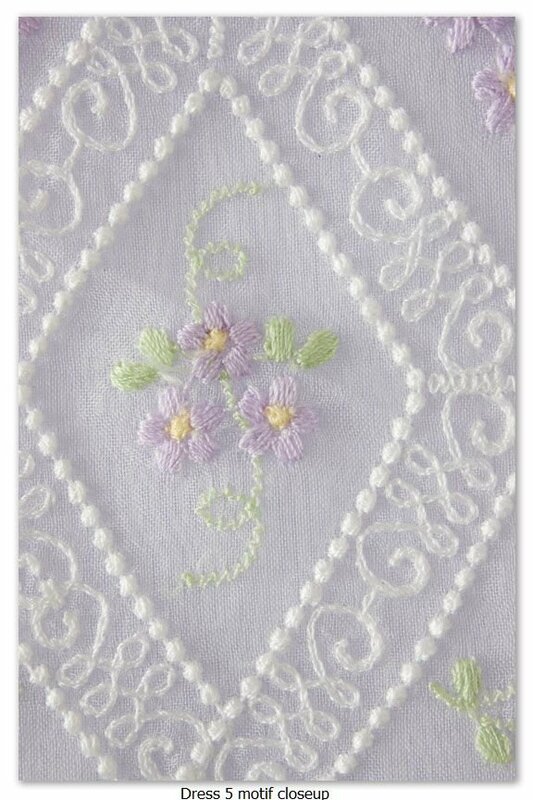 This is heirloom embroidery at its finest! I have combined 16 years of digitizing experience and 22 years of heirloom sewing experience to create 5 of the most exquisitely embellished heirloom dresses ever. People do not believe that these garments could have been done on an embroidery machine. Isn't that what we all want to hear about our work? Most of the embroidery is done on silk organza which is surprisingly affordable and absolutely perfect for my light and airy designs. The gals collars and sashes all stitch in the hoop, completely embellished and ready to cut out and use. 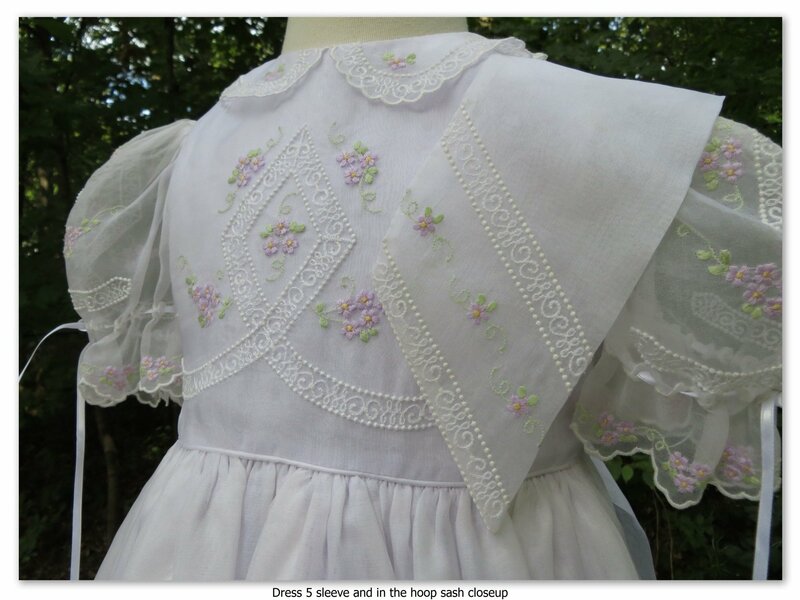 There is a wonderful first communion dress of silk dupioni with organza trims and sleeves featuring the cup and wheat to symbolize communion, and a matching rosary bag to stitch in the hoop. There is a frothy pink dupioni and organza overlay dress and a white Swiss batiste dress embellished with delicious pink shadow loops - a completely new technique. The other two stunners - one in ecru organza over ecru batiste and the other in white organza over lavender batiste - feature my new faux lace shaping designs which look so much like real shaped french lace that you will have to look twice to believe it. When you look at the photos of these dresses in the gallery, remember that there is no lace on these dresses - only embroidery that looks like lace! 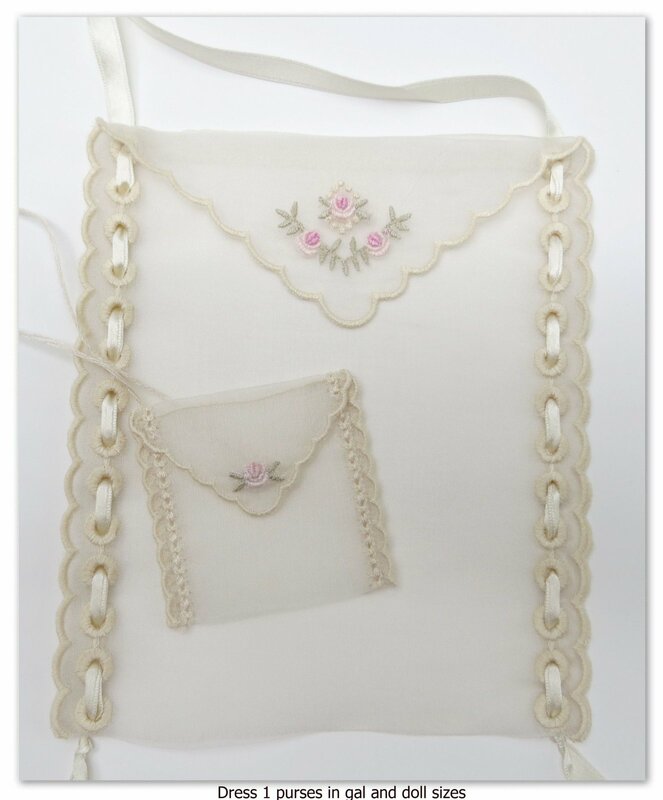 Each dress design set includes a matching purse in the hoop. 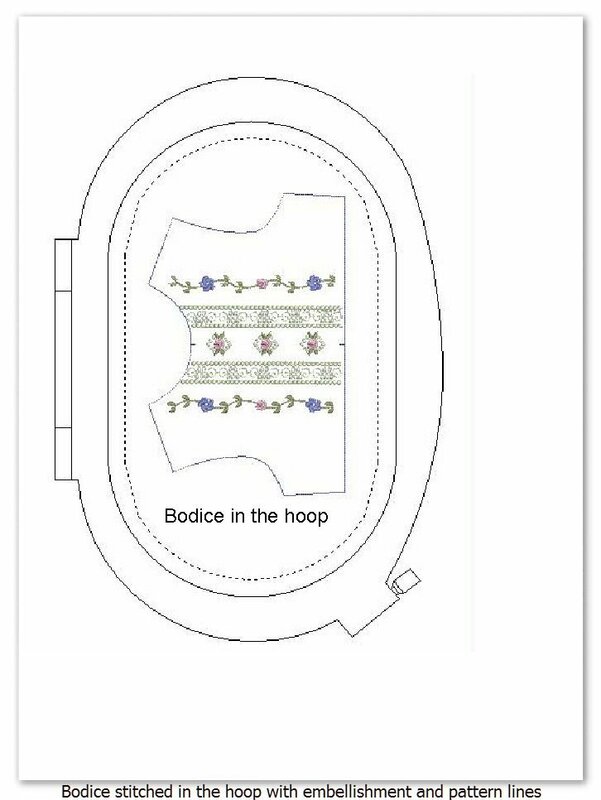 The package includes a very basic girl's paper dress pattern in sizes 2, 4, 6 and 8, and all of the collars are digitized in each of those sizes. 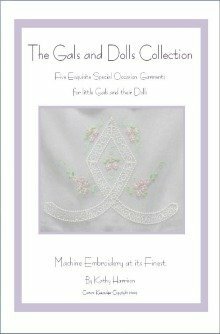 To bring out the little girl in all of us, the Gals and Dolls Collection also includes a mini replica of each of these spectacular dresses for 18" dolls that will stitch right in your embroidery hoop, pattern lines and all. 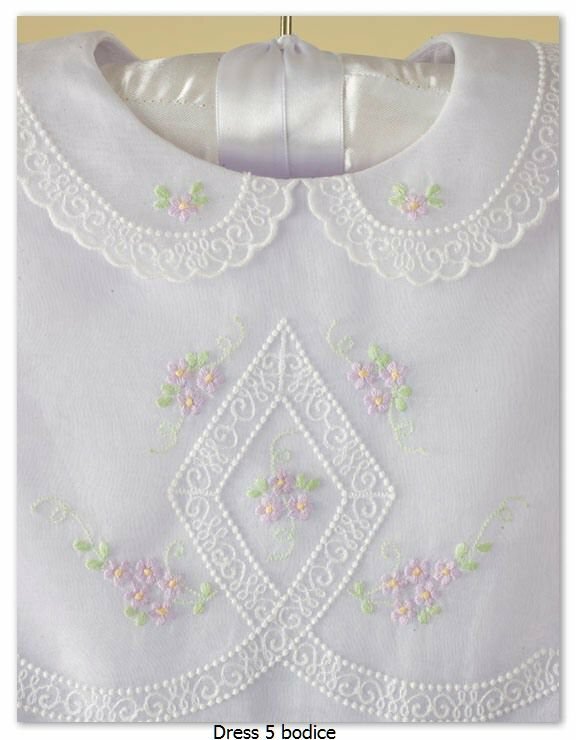 Each sleeve, front bodice, tiny peter pan collar and sash is already embellished, with dolly pattern cutting lines included in each stitch file. You just stitch each piece, cut out along the stitched pattern lines and sew it together! A dolly purse and slip in the hoop are also included. The collection includes an extensive 32 page spiral bound instruction book that gives detailed descriptions and illustrated instructions for stitching and constructing these showstopping gowns for either your little Gals or your little Dolls, or both. There is a BONUS set of religious designs included as well, for a total of 6 design sets for each Gal and Doll. Dolls dresses will fit in a 5 x 7 hoop. Other design sizes are listed on the Design Catalog. Also see garment photos here! 6 machine formats are included. Photos of each garment are included on the CD and in the gallery on this website.